I recently invested in a micoplane because after watching countless hours of the Food Network, how could I not have one in my arsenal? I thought for its inaugural voyage I would take a crack at making my own salad dressing. The ingredients are simple. 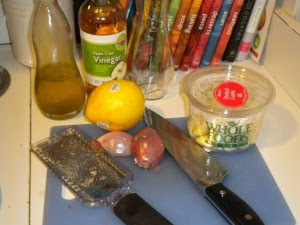 Olive oil, vinegar (I had apple cider on hand), a lemon, a shallot, garlic, various herbs & spices. The rest is easy. Microplane the shallot and two cloves of garlic (watch your little fingers!). Take the zest off the lemon, and drop them all in your container of choice. My choice is obviously a good seasons bottle. Juice the lemon, and add as much olive oil as you like. I drizzled mine out of the bottle until it felt excessive, but it is no doubt a fraction of what you’d get in store bought. Add a splash of vinegar, some pepper, Italian herbs, whatever you like, and VOILA! And as an added bonus, mine is mostly organic. Everything but the vinegar and pepper are certified organic, which make me feel even better about it. Keep it on the counter, give it a good shake, and you have cheap and healthy homemade dressing for the week.